Some of you will immediately recognize this sophisticated piece of jewelry from a long lost past epoch of civilization, one that long ago faded away; those past times are once again becoming the present. Do take the time to thank the innate store house of your DNA’s Memory for the recognition that this pendant may well elicit. This purposeful pendant (24K Gold) will keep the wearer focused on their higher aspect of self; so, too, will it allow for conscious continued refinement of this very self. As an owner of this most majestic and magnificent, high end jewelry piece, I can only say that I feel completely balanced when wearing this piece. From the width/thickness of the pendant, to the depth of the cavity, to the wall thickness, the overall dimensions of this pendant have been based on the ratio of the Golden Mean (1.618). The main dimension, the diameter, is also 1.618 inches. The Golden Mean (1.618) ratio is the same ratio that allows for an orgone charge to accumulate, courtesy of the spiral action, as is also the case within nature. A true and pure accumulator, I know of no other modern man made creation such as this pendant/device. The cavity of the jewelry is filled with an orgone/tachyon matrix which consists of organic material (resin and crystals) and inorganic materials (fine metal particles). Each pendant has 5 jewelry pointed Quartz crystals mounted in this orgone/tachyon matrix, one of which is also wrapped in a wire metal coil. Four of the crystals are mounted at 90 degree increments around the inner diameter of the pendant, thereby locating them at the north, south, east and west positions within the device. The coiled Quartz then becomes mounted in the center most location of the pendant. Both orgone and tachyon are names for the same pure creative beginning of the energy continuum; a completely sympathetic force in which all of creation is derived and has its beginnings. Mind uses this force (by means of thought) to create all that is and is not. An orgone/tachyon device that utilizes an orgone/tachyon matrix simply breaks down lesser vibrations, frequencies and energies, transforming them back into this most pure creative force before radiating a concentrated field (aura) of this force around itself. Wilhelm Reich, Walter Russell and Karl Schappeller are the best starting points for future study, should it be your desire to expand your consciousness on this topic. Each pendant is brought to a high finish and luster, after which it is plated with thick layers of copper and nickel, before the final finishing layer of 99.9% of 24K Gold. 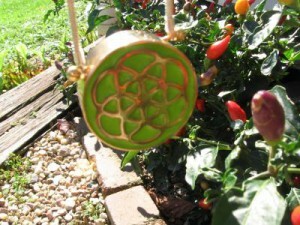 Essentially, this pendant is a pure thought device encapsulates and conveys knowing, and knowledge, to the trained eye. The SEED OF LIFE is essentially the blue print to all the forms that form as creations. The way vortex upon vortex come together to form creations. Likewise for the way built up forms radiate its form back to non form. The complete mathematics to the way of the vortex/spiral is all right here for you, if you wish to do some concentration. In biological forms, the seed of life in terms of cell division is created when the first cell divides three times which forms eight total cells; these eight cell remain with the biological form at its geometrical center throughout its entire life span. All other cells die and get replaced as new, except for these original eight. This is highly refined device/piece of eloquent beauty that you will not find anywhere else.